TL;DR - Here is the GitHub link: https://github.com/paul-ridgway/aero-keyboard, which documents the protocol and has a few utility scripts and examples. For the first time in a long while I have decided to get a personal laptop. After debating the costs of a new one I decided for the spec I was looking for getting something on eBay would save a fair bit (and in some cases come with active warranty). That said, the spec I was looking for was not so common - high end i7/Xeon, a motherboard that could take 32GB RAM (if it did not have it already) and ideally two hard drives, plus a FHD (ideally non-gloss) screen (4k and linux don't mix well in my experience and touch is overrated, both of which seem to come as a package). This leaves things like the Dell Precision 5520 (an excellent laptop in my experience) or 5530, Lenovo P1 and a few others that actually surface on eBay - few of which are available 'used' or 'refurbished', likely due their hefty (3k) price tag at full spec, and fewer were the full spec or upgradeable at a good cost. The Dells were hard to find with the extended battery too. I started searching by spec rather than make/model and found the Gigabyte Aero series (some older and some newer). The Aero 15W is perfect - i7, space for two NVMe drives, FHD display and two RAM slots capable of 32GB. As a bonus the battery (along with the whole laptop) is reviewed well and it has actual ports(!) - including LAN, USB3 x 3, USB C, HDMI and Mini-DP. If that wasn't enough there were a couple available on eBay for a reasonable price. 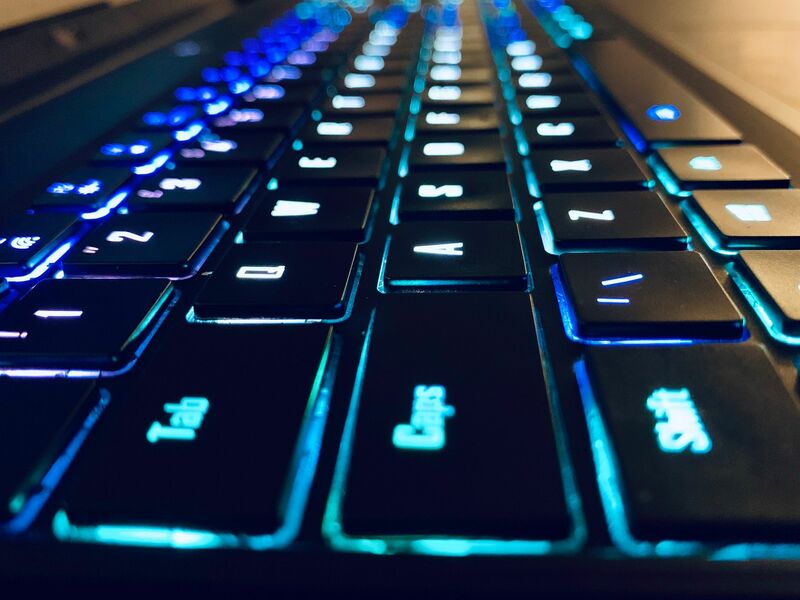 Now, this laptop comes with a backlit keyboard, like most these days - however this one is a fancy RGB keyboard with effects and configurable mappings etc. For Windows, Gigabyte provide all the drivers and software. However, I use Ubuntu for most things, and there is no support for the backlight options. It also seems some of the Fn control-keys are not supplied as normal keystrokes (like brightness controls - more on this later). So, the challenge - support the keyboard at some level (not strictly driver level), ideally configuring the backlight and handling specical keys that provide material convenience, like the brightness controls. For those Googling, it seems this is the same Keyboard as (at least some of) the Aorus-series laptops. 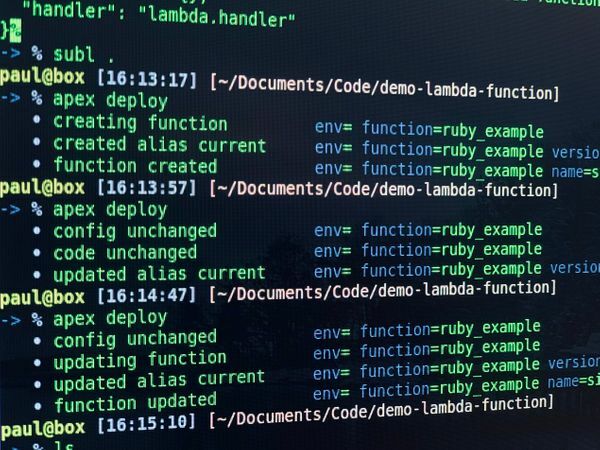 The following steps inspect the process of starting with a working configuation (the Keyboard on Windows) and reverse engineering the protocol to the point a demo app can be created that executes some of the functions. 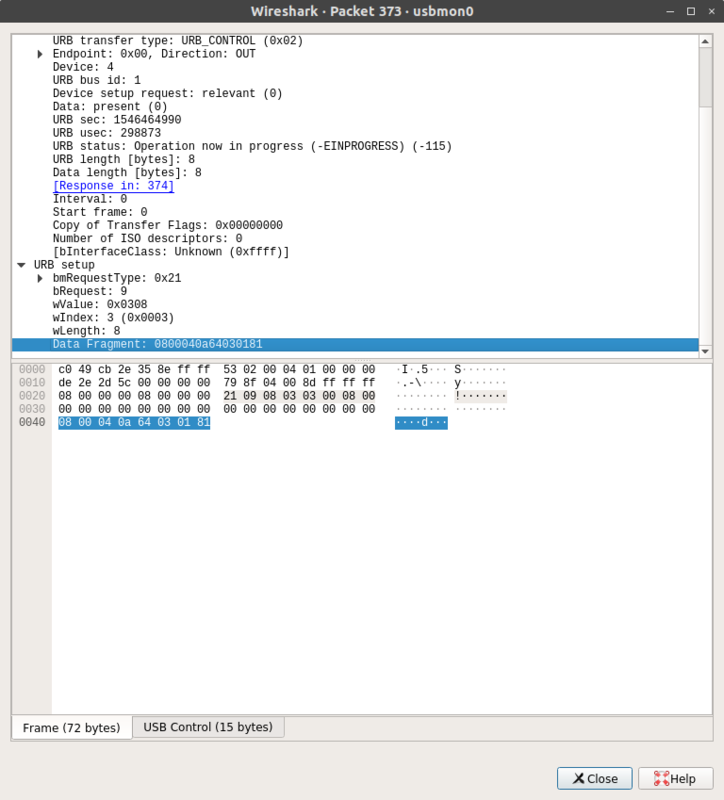 Inspecting hardware on Linux is often easily achieved with lshw, lspci and lsusb. lspci showed Intel, NVIDIA, Realtek devices along with the hard drives. There are two 'unknowns' in the lsusb output, Holtek and Sunplus. Bus 001 Device 003: ID 1bcf:2c6b Sunplus Innovation Technology Inc. Bus 001 Device 005: ID 04d9:8008 Holtek Semiconductor, Inc. The Sunplus device is the camera, and after some Googling Holtek is the Keyboard. Searching the VID (04d9) and PID (8008) returned amongst other things this project's issue: https://github.com/openrazer/openrazer/issues/376, suggesting the device above is the Keyboard. The keyboard presenting as a USB device is fortunate (to be honest, its not likely it would be much else), but it plays to prior experience, plus likely makes reverse engineering easier as the control messages are also sent over the USB channels. Why? Because the official software is available for Windows, so I created a Windows 10 VM using VirtualBox and attached the keyboard device. Once installed on the VM the Gigabyte could successfully control the device. 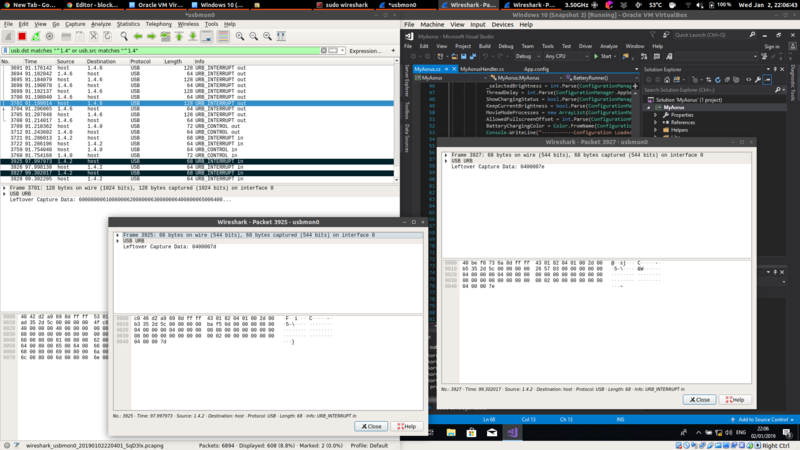 Wireshark can capture USB traffic on both Windows and Linux - as far as I observed they both capture the same data, even when the device (keyboard) is attached to the VM, which for me made capture on Linux easier. The external keyboard is also useful here because it means the traffic can be filtered to avoid control inputs (keyboard and mouse). 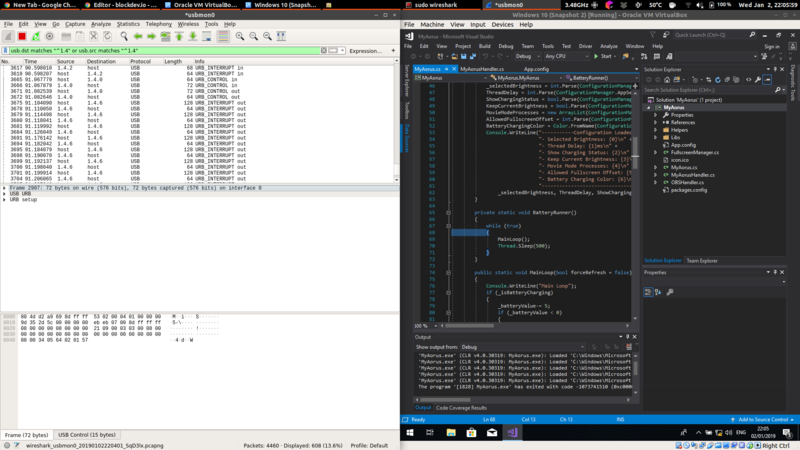 As part of my research I found another project to create a Windows SDK - https://github.com/Nesh108/MyAorusKeyboardSDK. The reverse engineering strategy then split into using the Gigabyte App along with this project to create scenarios to understand the packets. I modified the MyAorusKeyboardSDK to fabricate a rapidly changing battery level so that it was updating the keyboard more regularly. My knowledge of USB is limited, with some experience working with HID in the past. Devices are available on Busses, eg. /dev/bus/usb/001/004 where the bus is 1 and the device address is 4. This message looks similar in structure to that documented on the MyAorusKeyboardSDK. The code from the MyAorusKeyboardSDK project was hard to port directly as the terminology from the Windows HID Driver/SDK and methods does not relate to a lot of other documentation, which talks largely of feature reports, however there is a ruby project that focusses on USB HID, hidapi. Looking through the code it seems the wIndex relates to the interface (see: https://github.com/barkerest/hidapi/blob/d4e8b7db3b0a742071b50fc282bdf8d7a3e062a7/lib/hidapi/device.rb#L385). In the first tests, when connecting to interface 0 with libusb the keyboard would be unusuable and any IO would error. It seems interfaces have endpoints for different purposes (again not a USB expert), and the Feature Reports (control transfers) go via 1.4.0 whereas ad-hoc data (interrupts) goes via 1.4.6 for interface 3. Connecting to interface 3 also fortunately did not prevent the keyboard from functioning normally, unlike interface 0 which required detatching the kernel access before connecting and re-attaching afterwards, which naturally could also be flimsy if the application crashed. Now knowing where to send data and having some example packets we can start trying to control the keyboard. The gist below is a crude example where the USB address is hard-coded, and uses some pre-defined packets (structure explained later) to cycle through a few keyboard colour configurations every 2 seconds. This uses the hidapi library as that nicely handles the sending of Feature Reports. Bus 001 Device 004: ID 04d9:8008 Holtek Semiconductor, Inc. The Arch Linux Wiki has a good page on udev and rules. The control mechanism seems to be an 8-byte USB HID feature reports. 1 Unknown? 0x00 Values appear to make no difference. 6 Unknown? 0x01 Values appear to make no difference. A few examples below, with checksums. They keyboard supports 5 static custom layouts which are essentially an array of keys. Programming requires the selection of the custom layout (as above), issuing a 'start programming' command, sending the data then selecting the layout again. The data is sent as an array of [key_index, red, green, blue] in batches of 16 values (64 bytes each). There are about 120 key indexes, though not all are used on all keyboards. cidx represents the custom profile index, but zero based, so Custom 1 is 0, Custom 2 is 1, etc. chks is the usual checksum. Send the data (this example is the data from the group-based mapping described below). The Key index mappings for the UK keyboard can be found here. There are also a number of groups defined here for convenience. Later entries override earlier ones, hence setting the fallback colour for all first. In the GitHub repository there are currently a number of examples to set built in animations and custom layouts. I am working on a more general script but that will take a little longer so updates will follow!